With the summer months heating up, I've become really interested in recipes I can make and then freeze in individual portions. For breakfast, frittatas are a great solution. The combinations are endless, providing plenty of variety. And they warm up easy in the microwave. 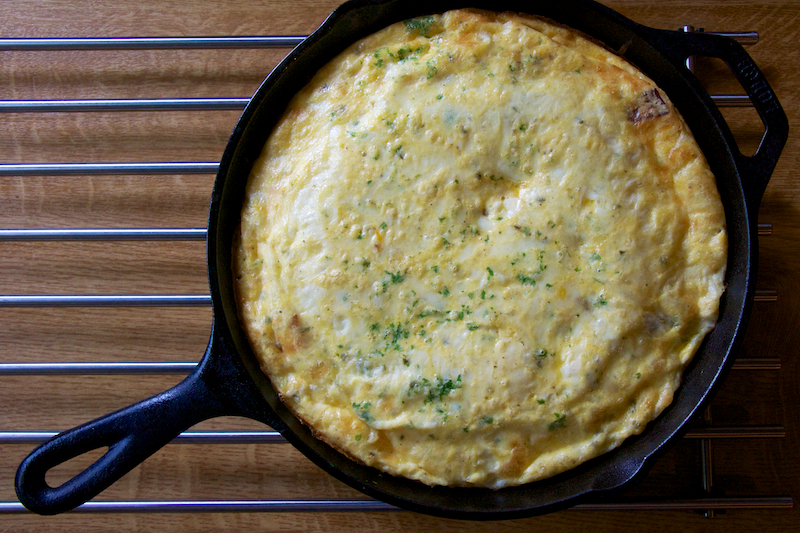 You might remember I shared my Bacon, Basil, and Feta Frittata recipe a while back, yes? It's so yum. This is my newest combo. The potato adds some heartiness for those mornings when you just want a little something more. Preheat your oven to 400 degrees. Then, in a large bowl, whisk together 8 eggs with ½ cup of half-n-half, 1 cup of pepper jack cheese and some salt and pepper (to taste). Set this mixture aside for now and pull out your cast iron skillet (10"). 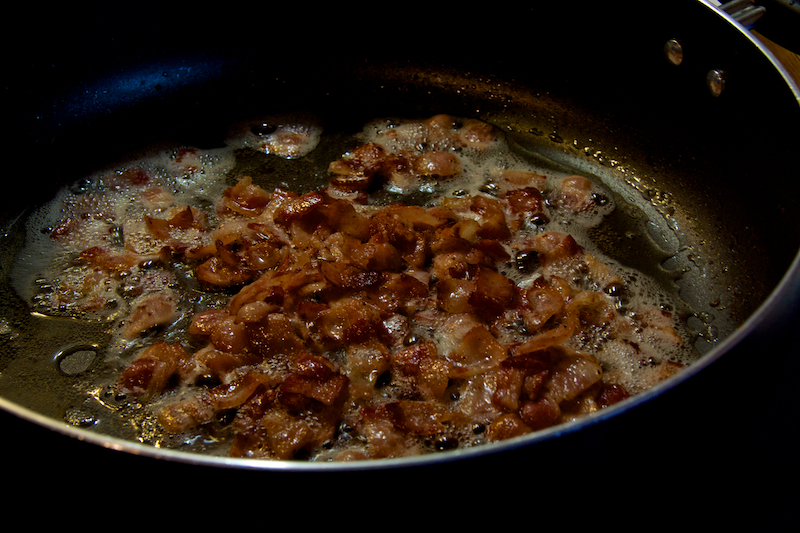 When the bacon is cooked through, remove it from the skillet with a slotted spoon and set aside to drain. 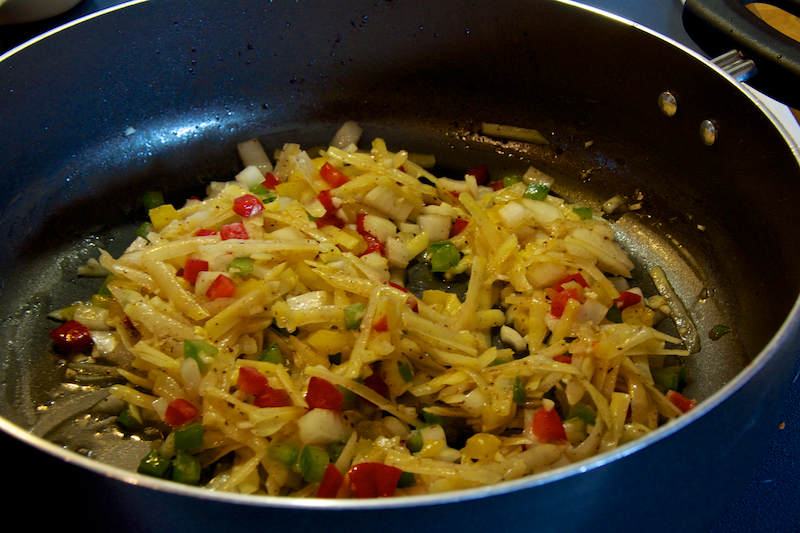 To the bacon grease left in the skillet, add 1 diced yellow onion, 1 diced bell pepper (any color or combination of colors), 2 cloves of minced garlic, and 1 grated potato (I used a yellow one, but I think a red potato would be awesome too). Potatoes grate easy using a regular cheese grater. 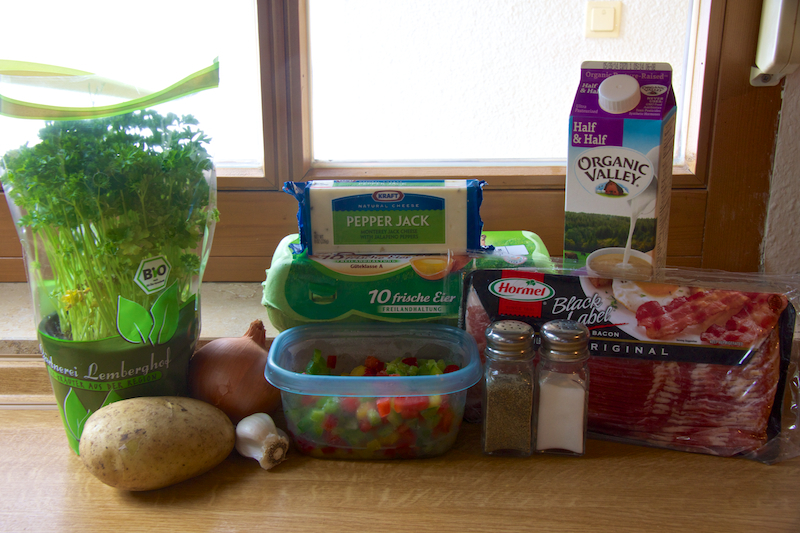 Cook this over medium heat until the potatoes are tender and browned, about 15 minutes. Then stir in an ⅛ cup of fresh parsley. 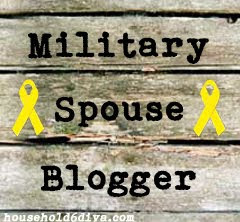 Pour your egg mixture over the potato mixture in the skillet. Cook in the skillet over medium heat, without stirring, for 5 minutes. 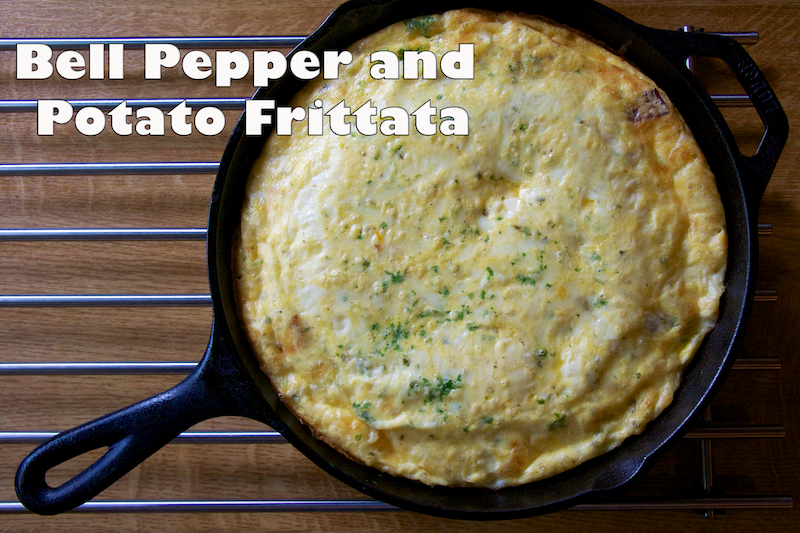 Sprinkle an extra ½ cup of pepper jack cheese over the top and then transfer your cast iron to the pre-heated oven for another 10 - 15 minutes, or until the center of the frittata is set. Cool at least 5 minutes before slicing. As always, the standard recipe is below. Until next time, happy cooking! Whisk together the eggs and the half-n-half in a large bowl. Add salt and pepper to taste, and 1 cup of the pepper Jack cheese. Set aside. Cook the bacon pieces in a 10” cast iron skillet over medium heat until cooked through. Remove from the skillet with a slotted spoon and set aside to drain. Add the onion, potato, bell pepper, and garlic to the skillet with the bacon grease (if necessary you can add 1 tablespoon of butter to the skillet). Cook over medium heat until the potatoes are tender and browned, about 15 minutes. Stir in the parsley. Pour the egg mixture into the skillet. Cook over medium heat, without stirring, for 5 minutes. 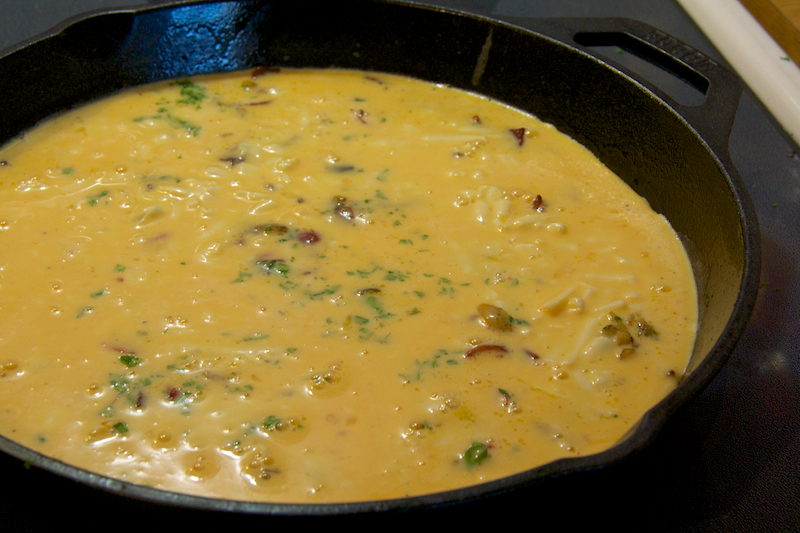 Sprinkle the remaining ½ cup of pepper Jack cheese over the top of the egg mixture. Transfer the skillet to the preheated oven. Cook 10-15 minutes or until the center of the frittata is set. Cool 5 minutes before slicing and serving.